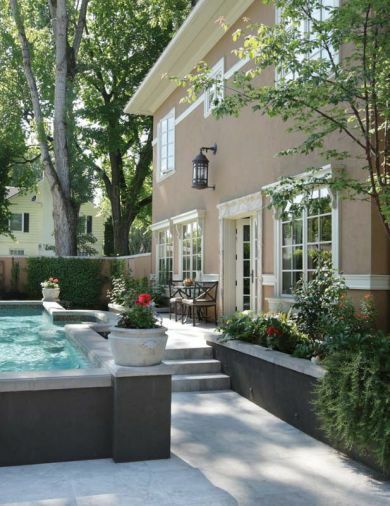 Dark espresso colored stucco outlines the raised 14’x 36’ pool that spans the Brennekes back yard. 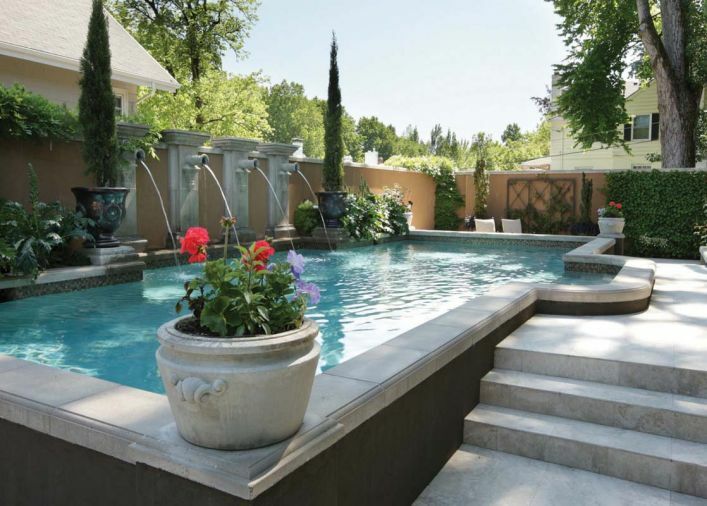 Putting together the pre-cast pool pieces to create squared off corners took great mathematical precision, says landscape architect Craig Kiest. Lisa plants the colorful seasonal flowers for the pool’s corner pots, as well as the heirloom roses in the bed at left, grown from seed in St. Paul, Oregon. What others saw as “run-down,” the Brennekes envisioned as both an investment opportunity and the chance to recreate the Italian way of life Lisa’s paternal family was forced to flee in late 1940s Fascist Italy. In keeping with Italian architecture, the courtyard is completely unseen from the front entrance of the Brennekes’ 3800 sq. ft. home. 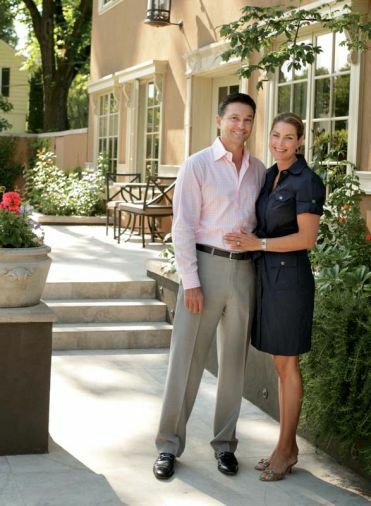 Tom and Lisa Brenneke stand alongside the back of their entirely remodeled 1909 Italian villa on a beautiful summer’s day. Adjustable Lutron lighting systems set the scene at night. 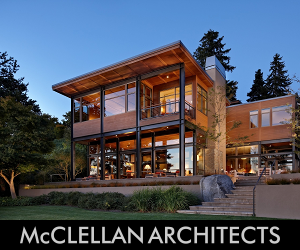 Tom and Lisa Brenneke undertook the major renovation of this 1909 Italian style Portland Heights home and gardens with the same alacrity and passion that epitomized their whirlwind courtship and marriage in 1999, nearly a century after their jewel was built. 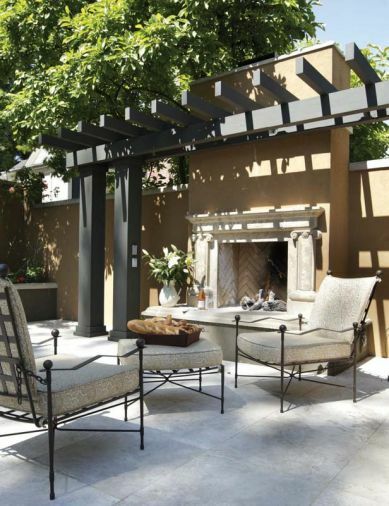 The outdoor gas fireplace is handsomely offset by a dark espresso stained arbor that reiterates the espresso colored stucco from the nearby pool. The spa is tucked beneath the kitchen window. The barbeque is kept handily from view behind painted levered doors built into the courtyard wall. When the Brennekes were unable to find a table suitable for the dining room chairs they liked, Kiest designed one that suited both the chairs and the allotted space. French doors off the dining room open onto the back yard, where the Brennekes’ Italian greyhounds love to play. 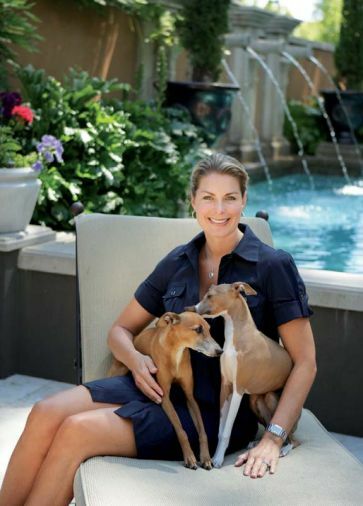 Lisa sits at right with her beloved Italian greyhounds at the foot of the pool. “I love the sound of the water spilling from the Cannons,” says Lisa, of the hot water that tumbles into the 4.5’ deep pool all summer long. 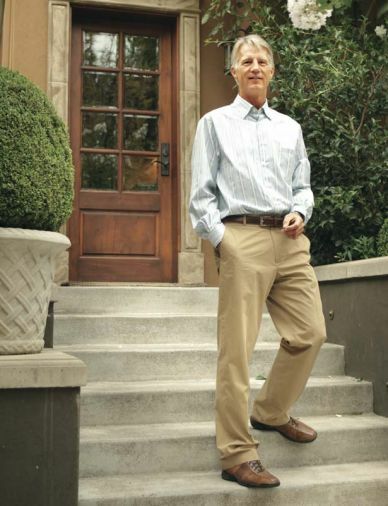 Landscape Architect Craig Kiest of Huntington & Kiest. 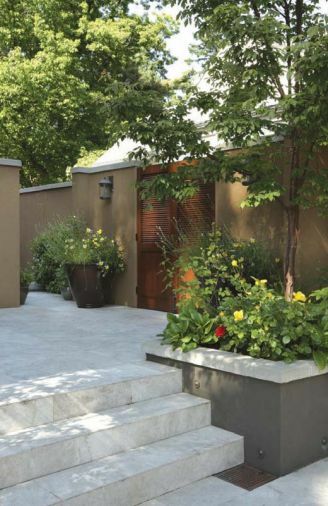 Larry De Block Landscaping Company maintains the garden’s beauty year-round. Lisa Brenneke, a native of San Clemente, California, who strolled confidently down the fashion runways of Europe as a young Calvin Klein and Ford Agency model, grew up on a farm in Stayton, Oregon, from the time she was eight. 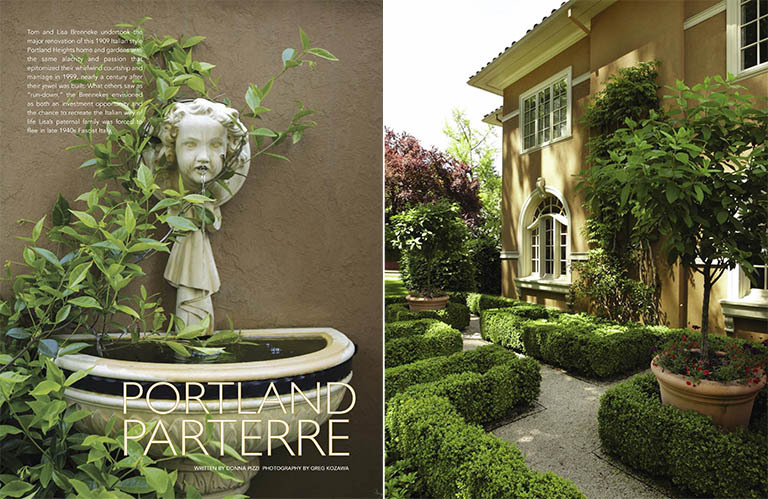 Not long after returning from Europe, where she learned fluent French, passable Italian and the joys of la dolce vita from her Piedmontese father and British mother, Lisa met Oregon native Tom Brenneke, President of Guardian Management LLC, a Portland-based real estate business started by his grandfather. Brenneke, who diversified the company’s multifamily fee management business to embrace a broader-based ownership position that included the purchase and award-winning restoration of another 1909 Portland landmark - the Crane Building in the Pearl – shares Lisa’s passion for art, architecture and travel. After only 41 breathtaking days together, Brenneke asked for her hand in marriage and the couple was married six months later in Oregon’s oldest sanctuary - Oaks Pioneer Church. To achieve that goal, the couple put together a formidable team starting with builder Dave Jones of D&J Remodeling, whose work was so stellar the Brennekes now count him as a friend. “He’s a remarkable person,” says Lisa, “very detailed, able to manage multiple subs all at once – just a talented guy.” Jones held weekly meetings during the year-long project, which were attended by interior designer Lisa Warnock, then principal of Portland’s Tandem Design (now Glow Interior Design), and the much sought after landscape architect Craig Kiest of Huntington & Kiest. “When I came on board, the house was completely under construction. Of the original house, only the east-facing wall with its two windows and fireplace was left standing,” says Kiest, a native Oregonian, whose undergrad degree in economics led to the improbable graduate studies in landscape architecture at UC Berkeley, following a semester abroad spent perusing Italian gardens. 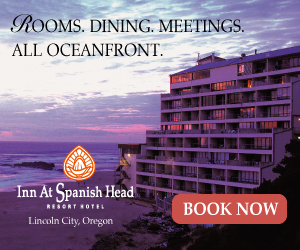 “We are blessed with spectacular views here in Oregon,” says Kiest, “but if your home doesn’t have one, then you do as the Brennekes did, you create an inner view, whether it’s with a hedge or a wall. It was the Brennekes’ choice and a good one to complement the house with an Italian feeling.” During Kiest’s stay in Italy, he viewed countless palatial gardens built in medieval times, but it was the hidden courtyards that left him frankly more abashed. “After three months, you see that everyone has an interior courtyard and it’s what each homeowner did with it that made it unique.” The Brennekes worked hand in glove with their team to transform their forlorn property into what Lisa calls “an Italian oasis”. 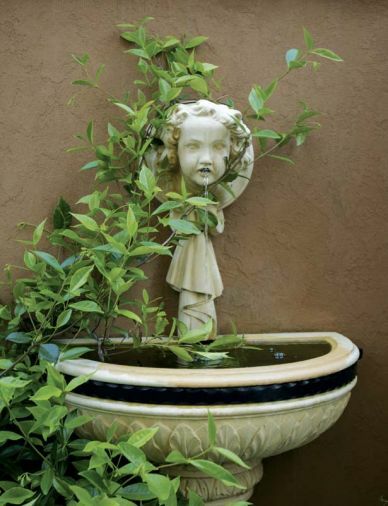 “Laying out the courtyard was like a puzzle,” adds Kiest, who nestled the mechanics of the hot tub cover beneath a bank of potted plants near the kitchen window, so that only an ornamental fountain whose pipes are hidden in the stucco wall is visible from within. 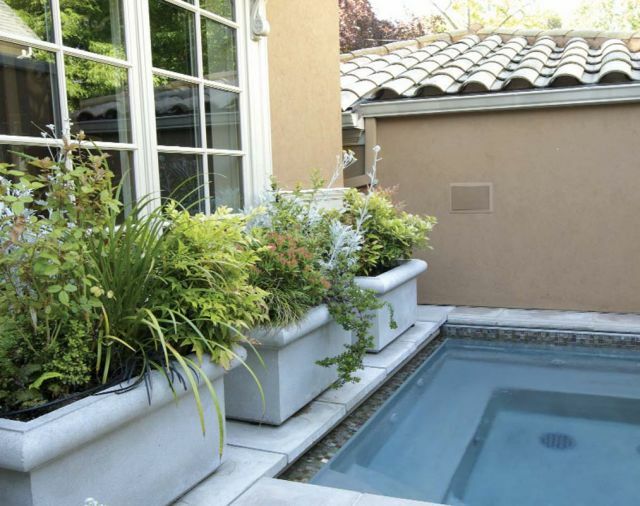 The pool equipment resides beneath the kitchen terrace, resting on the abandoned basement stairs accessible now from within, while the stereo speakers are camouflaged in faux rocks and the gas meters are tucked behind German boxwood parterre hedges. The cozy gas fireplace sits opposite the raised pool alongside a custom-designed mirror on the wall that adds a sense of infinity to the space. Probably the most heroic member of the team was an Italian mason of Venice Genoa Tile, who literally set up shop on the premises for three months while he single-handedly laid the travertine flooring, wall caps and pool tiles. Kiest designed the original “Cannon” water feature, as they call it, which he fashioned from oversized roof water spouts topped with pillar caps and flanked by a pair of potted Italian cypress in urns. Neptune Pools installed the pool. Q: WHAT IS YOUR FAVORITE OUTDOOR ACCESSORY? CRAIG: Architectural elements are outdoor accessories that can add a bit of personality to a site, from an old piece of iron fence to a handmade framed mirror. On a grand scale it could be a Lee Kelly sculpture, but even a simple obelisk can welcome you into the site. Q: WHERE IS YOUR FAVORITE PLACE TO GO AND ADMIRE THE SCENERY? CRAIG: When I go out to enjoy scenery it becomes a process of connecting to nature. For a peaceful respite from the city, I head up to Macleay Park on NW 29th and Upshur Street. (Editor’s note: The park is named after Donald Macleay, a Scotsman who claimed in 1897 that the property taxes were so high on the land that he’d rather give the property to the city in commemoration of the 60th anniversary of Queen Victoria's reign, than carry the tax burden.) If time allows, I am off to the Columbia River Gorge. For the urban experience, I look at the complexity of city life and the intersection with nature in places such as East Bank Esplanade or Jamison Park. Q: WHAT'S "HOT" IN THE WORLD OF LANDSCAPE DESIGN? CRAIG: Green roofs are a “hot” topic in landscape design, both technically and aesthetically. As Portland goes up with new residential towers, more of us have a view of the missed opportunities of green roofs. In South Waterfront, the green roof of Atwater Place, as viewed from the John Ross Tower, adds to the aesthetics by softening what would have been a blank roof and allowing the eye to be drawn out to the river and Mt. Hood views. With the added benefit of cleaning the storm water, I hope that green roofs are here to stay. Q: HOW IS YOUR HOME LANDSCAPED? CRAIG: At home in the city I just have a simple porch. But in the country where I have space, I like to create paths and “organize” nature into rooms. Q: WHAT MOST INFLUENCES YOUR WORK? CRAIG: The need to connect to the environment influences my work. Falling back on 30 years of experience, I look at how to give the client ownership of the project, whether it is a small city garden or a large public space. My process is to sort through the words and understand the client’s vision. I like the interaction with clients and the exchange of ideas. I recently attended the American Society of Landscape Architects (ASLA) conference in Philadelphia, where several of my peers presented talks about their work. Like me, they didn’t know growing up what a landscape architect was or what they did. Most had a late introduction into landscape architecture, generally discovering the field after high school. My initial exposure to landscape design would have been my father’s keen interest in garden building. Growing up, we landscaped three large properties, trying out new plants and construction methods. I thought it was gardening, but it was really amateur landscape architecture. I decided to become a landscape architect my junior semester abroad in Italy, where I was immersed in Italian gardens. Interestingly, I have had occasion over time to return to the Oregon gardens of the various houses in which I grew up and to redo the whole yard. I can still remember when various trees were planted, and, in some cases, we’ll have to cut one down, because after 30 years, it has outlived its life expectancy. It has been gratifying to watch how a greater understanding of the profession of landscape architecture has grown over the years. I also enjoy meeting with young people who are looking into the profession and sharing with them my experiences. I explain that it is a complex discipline from city planning to residential design. Q: WHAT DO YOU RECOMMEND PEOPLE SPLURGE ON WHEN IT COMES TO THEIR GARDENS? 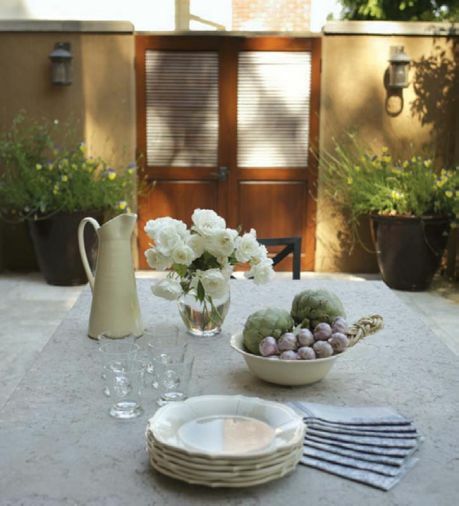 CRAIG: After the installation of a garden, it is time to enjoy the newly created space. Often there is a place in need of furniture. This is where I think one should splurge on comfortable furnishings, such as a cushioned lounge chair with an ottoman. If it is possible to add some heat as we did in the Brennekes’ garden - all the better – as a fireplace can be an inviting addition to extend the use of the garden into the evening. Q: WHAT IS YOUR FAVORITE PLANT OR FLOWER? 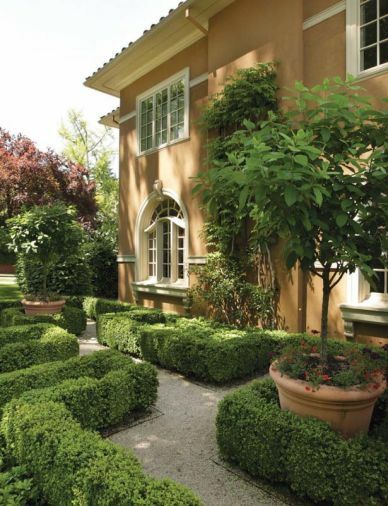 CRAIG: While I don’t have a favorite plant or flower, I do enjoy formal gardens. I tend to lean toward soft drifts of shrubs and perennials in my garden, where there is minimal maintenance. Pruning is a hobby that I don’t want to become a chore.